The basic idea is that the product of two functions can be visualized as the area of a rectangle. 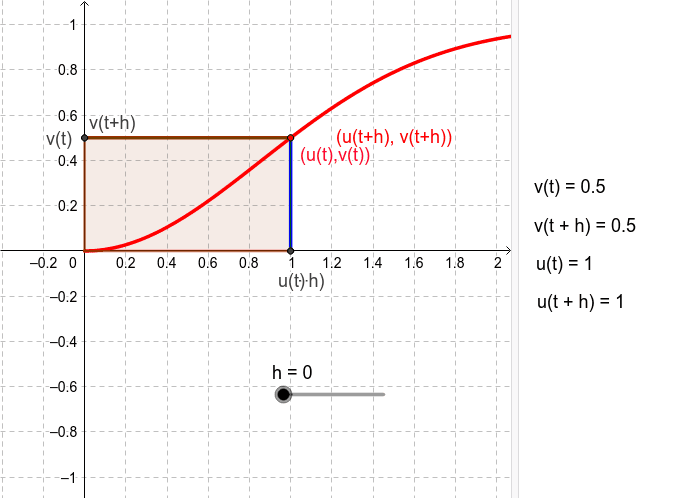 NOTE: the curve below is PARAMETRIC, meaning that each point on the curve represents (u(t), v(t)) for some t, NOT the point (t, f(t)). SET h = 0; we will define the rectangle you see as our INITIAL rectangle. SET h = 0.6; calculate the INCREASE in the area by calculating the sum of the areas of the blue, green and brown rectangles. Then, divide this area by the value of h, giving your answer correct to 3-significant figures. SET h = 0.4; repeat what you did above. SET h = 0.2; repeat what you did above. SET h = 0.1; repeat what you did above. What do you notice about the values you calculated as you reduced the value of h? Consider the expression shown in the applet BELOW. What does NUMERATOR represent? Set the value of t to t = 2. As you move the value of h, closer to 0 what does the value of the fraction represent? Set the value of t to t = 1. Again as the value of h moves closer to 0 what happens to the value of the fraction? What do the values you have found represent?